Open ceilings are a signature element of most contemporary office designs because of the spaciousness and casual, cool vibe they add to a space. Many decision-makers also assume open ceilings are less expensive than drop ceiling because they use less materials, labor, and time. But, do those assumptions play out in reality? Unfortunately, those findings don’t give the full picture. Over the years, our experience has shown that open plenum ceilings have many benefits—but costing less isn’t one of them. It’s important to plan ahead for the unforeseen costs of open ceilings, which typically make them come in as more expensive, particularly over a building’s life cycle. Open ceilings don’t require the new infrastructure that a suspended ceiling does, so it seems contradictory that they’d be more expensive. However, it’s not as simple as removing suspended ceiling tiles and walking away. Existing infrastructure that’s been hiding behind suspended ceilings is often unsightly, requiring major work to make it attractive to employees or customers. For example, those exposed ducts seen in modern offices are often not original to the buildings they’re in. Old ductwork is typically blocky, dirty, oily and generally not aesthetically pleasing. Round or oval ductwork, as we used in the build-out for Glassdoor’s new headquarters, delivers a more “finished” look, but is significantly more expensive. In addition to swapping unsightly ducts, space users want everything painted from the exposed ceiling to the ductwork and plumbing—a job that’s far more complicated than simply painting walls. This also helps tie together what you see when you look up with the color scheme, décor, and branding choices on the floor. In other words, the casual look of an open plenum is actually the result of a lot of skilled labor. As commercial construction has ramped up in recent years, developers are seeing a shortage of skilled labor in many trades, driving up construction costs. Open ceilings may involve lower material costs than suspended ceilings, in some cases, but any savings is more than offset by the cost of labor-intensive tasks required for open plenum. For instance, added labor-intensive tasks may include running all electrical distribution conduit tight to the deck above with the associated additional bends in the runs, rather than running all of the conduit that crosses paths at different elevations. 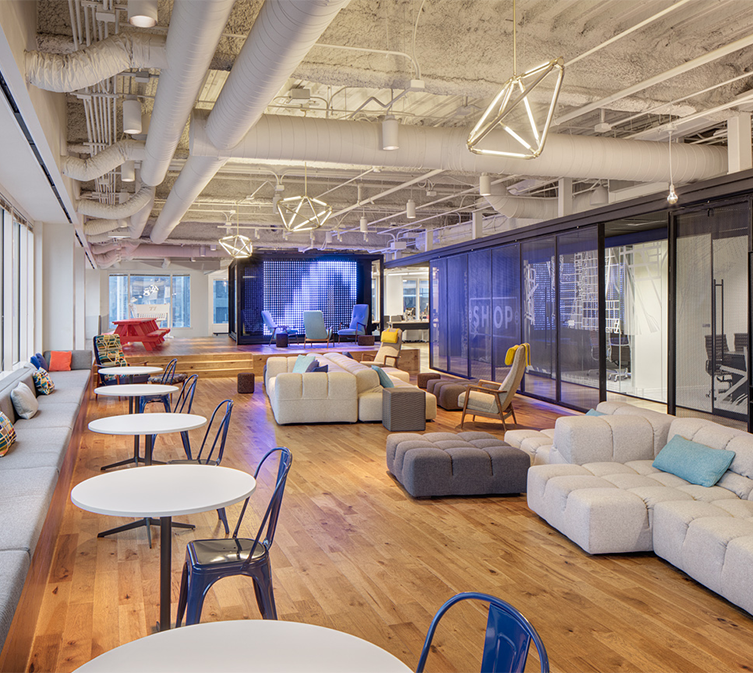 For our work on Capital One’s tech incubator space in Chicago, ductwork, electrical conduits, and other infrastructure were all seamlessly integrated so the ceilings complemented the colorful, yet sleek space. Another invisible, but inevitable, cost in open plenum plans is the need for acoustical treatments. The panels in suspended ceilings are called acoustical tiles for a reason: they absorb sound to keep ambient noise levels from being disruptive. The hard surfaces of exposed ceilings –and the cement floors and glass walls they’re often coupled with – create an echo chamber. And, as people raise their voices louder to be heard over the ambient noise, the noise is amplified. White noise systems can help, but some people find the white noise itself to be disruptive. If designers and construction firms don’t plan together to address sound issues, employee productivity, privacy and job satisfaction can suffer. For workplaces in which people must handle sensitive information, conduct frequent client calls, or collaborate closely with their colleagues, a noisy workplace is an ineffective one – and can create costly mistakes. Solutions for noise problems in open plenum plans add to renovation bottom line. Office users may install acoustical panels directly onto the deck, or suspend baffles to absorb sound in critical areas. Spray-on acoustical material applied to the ceiling’s hard, reflective surfaces is another solution. These products soften the surfaces to absorb some of the noise, and typically have other benefits such as thermal insulation and fire protection. Spray-on solutions also cost less than panels or baffles, however, no work can be done in the space while the spray-on material is being applied. This adds seven to 10 days to the construction schedule, diminishing the savings. Even if open plenum ceilings can be installed cost-effectively, operational cost considerations can change the equation somewhat. Many planners and designers now consider the entire life-cycle cost of different solutions, including the cost of energy consumption and maintenance over time as well as the initial materials and labor. The five-city CISCA study previously mentioned noted that energy costs were found to be lower in suspended ceilings than in open plenum ceilings, ranging from 9 percent to 10.3 percent energy savings in offices. In addition, CISCA noted that open ceilings required frequent cleaning and periodic repainting that’s unnecessary with suspended ceilings. The study concluded that when you consider both first-time and operating costs, suspended ceilings are extremely cost effective. All things considered, the additional cost of open plenum ceilings shouldn’t be a deal-breaker. Most companies that are investing in new or renovated offices will want the hip look and blank slate that open ceilings provide. And, designers’ primary goal is to create a space that’s appealing and productive for the employees who use it; incurring an incrementally higher cost structure is a secondary concern. Designs teams and their clients who are getting ready to build out space should be aware of the true cost of different alternatives to avoid unexpected budget blows. Informal, exposed ceilings may seem less expensive than suspended ceilings—but reality is often quite different. Make sure to account for added materials, added labor, and long-term efficiency when you’re pricing out your project. This article was authored by Skender Vice President Clay Edwards and originally published by Work Design Magazine.